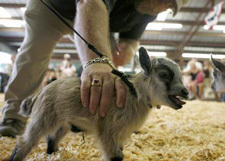 A pygmy goat, about this size, has been wreaking havoc in Muskegon County's Ravenna Township. The one pictured here is not the goat at large. He may be only 9 inches tall, but he’s monster. A tiny pygmy goat that escaped from a Michigan livestock sale has been causing havoc in the town of Ravenna for days, doing several hundred dollars in damage to homes and businesses with his tiny horns while eluding capture. Now the cops have gotten involved, but good luck to them. “He’s fast,” said one local. A man who had no way to get from Port St. Lucie to Hollywood, Fla., told police he had been carjacked, in hopes they would drive him there. They did not. But they did take him to the county lockup. 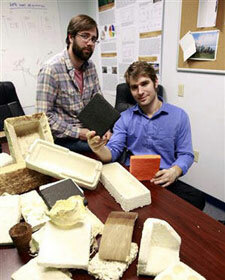 Eben Bayer, right, and Gavin McIntyre, co-founders of Ecovative Designin in Green Island, N.Y., on Thursday, Feb. 9, 2012. Some of their eco-friendly packaging materials are seen on the table. Turns out that mushrooms — great in soups and salads — also make decent packaging material. Mushrooms are a key ingredient in the pale, soft blocks produced by the thousands in an upstate New York plant that are used to cushion products ranging from Dell Inc. servers to furniture for Crate and Barrel. More precisely, the packaging blocks are made with mycelium — the hidden “roots” of the mushroom that usually thread beneath dirt or wood. Two former mechanical engineering and design students, Eben Bayer and Gavin McIntyre, figured out how to grow those cottony filaments in a way that binds together seed husks or other agricultural byproducts into preset packaging shapes. Their 5-year-old company, Ecovative Design, has a toe-hold in the increasingly lucrative market for eco-friendly alternatives to plastic foams — and their business is growing like shiitakes on a damp log. Bayer and McIntyre are already expanding their line for everything from footwear to car bumpers. This 3-year-old is the pre-school Rambo. Ashton Addison shocked his mom and teachers in Inverness, Scotland, after he escaped from his nursery school by climbing a 7-foot fence that was topped with spikes. The toddler was found with just a few scratches after about 10 minutes by a dog walker. “He is a really clever little boy,” his mom said. A McDonald’s Chicken McNugget found by Rebekah Speight of Dakota City, which she believes resembles President George Washington is placed next to a U.S. quarter dollar bearing the image of the president. 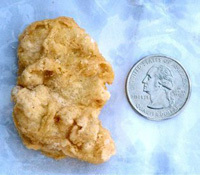 The top bidder for a McNugget that resembles President George Washington has chickened out of the $8,100 deal. Rebekah Speight (spayt) of Dakota City, Neb., told the Sioux City Journal for a Thursday story that the bidder was “very sorry” but had to back out. Speight says she has had the McNugget stashed in her freezer for three years and decided to sell it on eBay to help raise money for a drive to send children to church camp this summer. Speight says eBay rules allow her to offer the McNugget to the second-highest bidder, who had offered $8,000. If that falls through, she can offer it to the third-highest bidder and so on. She has 60 days to decide what to do.